"The Library is an engaging adaptation of Sarah Stewart's picture book about ardent reader Elizabeth Brown's love pf books. Although the story is rather uninvolving, the lovely pastel artwork (cats sleeping atop piles of books, etc.) and the rhyming cadence of the text should hold viewers' attention." "When Sarah Stewart's The Library was published (Farrar, 1995), librarians across the country looked at the endearing character of Elizabeth Brown and shouted "That's me!" 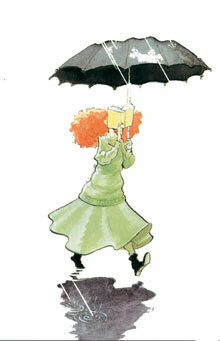 Anyone who grows up with as intense a love of books as Elizabeth is bound to bond with libraries in one way another. This sweet, simple story has now been issued in video and audio formats. The female narrator gives a warm, approachable reading to Stewart's gently humorous verse. The sprightly cello soundtrack suits the text perfectly. A few subtle sound effects enhance the story. In the video version, David Small's (Imogene's Antlers) softly shaded line drawings are panned to pick out the details which best describe the text. The whimsical, yet not altogether unrealistic story is a good choice for story hours and a pleasant introduction to the library for young or library-phobic children."